Knaack 6 Heavy Duty Casters Set Job Site Storage Boxes (4-Piece) Rigid/Swivel. The Knaack 4-Piece 6 in. To help you accomplish heavy-duty jobs. 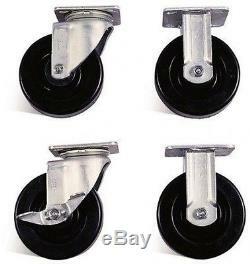 The casters feature steel construction with arc-welded seams for durability along with rubber wheels for easy maneuvering. Use for help when moving heavy loads. Steel construction with arc-welded seams and rubber wheels. Load capacity per caster lb. Our stock all ships from our US-based warehouses. When returning an item, it must be in all of the original packaging and include all of the original accessories or items that came with it. We do our best to process as quickly as possible. We know how important it is for you to get what you ordered and get it fast. Our products are a 100% authentic and brand new. We work with the biggest suppliers of high quality products to bring you only the best items. We consider it a top priority that our customers are happy and in the rare event that they are not, we do everything we can to fix the situation. No customer will walk away from our store unhappy. If there's a problem, just let us know and we fix it. We guarantee you only the best experience when shopping with us! The item "Knaack 6 Heavy Duty Casters Set Job Site Storage Boxes (4-Piece) Rigid/Swivel" is in sale since Monday, September 12, 2016. 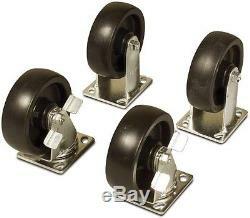 This item is in the category "Business & Industrial\MRO & Industrial Supply\Material Handling\Casters & Wheels". The seller is "practicalbydesign" and is located in Multiple Locations. This item can be shipped to United States, to Canada, to United Kingdom, DK, RO, SK, BG, CZ, FI, HU, LV, LT, MT, EE, to Australia, GR, PT, CY, SI, to Japan, to China, SE, KR, ID, to Taiwan, ZA, TH, to Belgium, to France, to Hong Kong, to Ireland, to Netherlands, PL, to Spain, to Italy, to Germany, to Austria, IL, to Mexico, to New Zealand, PH, SG, to Switzerland, NO, SA, UA, AE, QA, KW, BH, HR, MY, CL, CO, CR, PA, TT, GT, HN, JM, AG, AW, BZ, DM, GD, KN, LC, MS, TC, BB, BD, BM, BN, BO, EC, EG, GF, GG, GI, GP, IS, JE, JO, KH, KY, LI, LK, LU, MC, MO, MQ, MV, NI, OM, PE, PK, PY, RE.